Skelmanthorpe is a village situated in the Upper Dearne Valley in West Yorkshire. 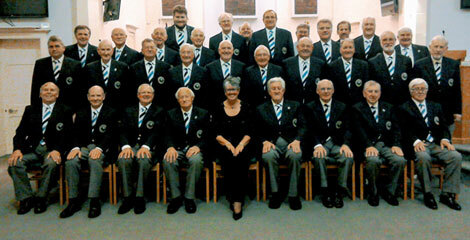 The choir was formed in 1934 and has continued its proud tradition of having fun and enjoyment through singing. Over the years the membership has been drawn from a wider geographical area which now extends to Huddersfield, Wakefield and Barnsley. We are a very friendly group led by a highly talented musical director and, although the fun side is important, we do take our music seriously in order to be a professional choir when performing for our appreciative audiences. If you would like to join us do come along to one of our rehearsals and give it a go – we would be delighted to see you. Would you like to support the choir? The annual Christmas concert with Black Dyke Band, unbroken since 1967, is a highlight for the choir and its supporters.